DUCK DUCK GOOSE follows a stubborn goose named Ping who cares more about his pride than the benefit of his community. By the end of this delightful animated comedy, Ping learns his lesson by taking care of two young ducklings who need his help, and vice versa. DUCK DUCK GOOSE follows a stubborn goose named Ping who cares more about his pride than the benefit of his community. DUCK DUCK GOOSE is set in China and begins by showing geese flying over an expanse of gorgeous greenery and bodies of water. While recklessly racing his girlfriend Jin Jing, Ping separates two ducklings, Chow and Chi, from their flock of ducks headed to Pleasant Valley. After Ping lands, Bing, the flock leader and Jin Jing’s dad, urges Ping to fly as the lead goose for the Junior geese on their migration path towards the Haven. Ping refuses, however. At night, Banzou, a wild cat, gets into a tussle with Ping, with Ping coming out on top. Meanwhile, Chow and Chi find shelter in Ping’s nest. They form an attachment to Ping that Ping doesn’t like. To continue Ping’s bad day, a metal gong falls on his wing making him unable to fly and head out towards the Haven. Now, he has to walk there. A wise turtle, Larry, reminds Ping that traveling with companions is the best thing to do. At this point, Ping remembers Chow and Chi. So, the two ducklings and the goose brave the long road ahead to the migration point. The animation in DUCK DUCK GOOSE is superb. It’s extremely detailed and not intrusive. Likewise, the realistic cultural practices of China such as farming, eating ducks and the Great Wall help make DUCK DUCK GOOSE a carefully thought out children’s movie. DUCK DUCK GOOSE’s endearing characters help make the movie compelling. The movie has a strong moral worldview with redemptive elements stressing community and sacrifice. Ping goes from being a total loner to a caring parental figure and flock member. The movie also showcases the value of sibling relationships. One brief scene depicts a stereotyped character who’s portrayed as a naturalistic healer. DUCK DUCK GOOSE also warrants parental guidance for some cartoon violence, scatological humor and allusions to animals being killed and cooked in a kitchen. DUCK DUCK GOOSE is appropriate for children but deserves parental caution. Pride and stubbornness but rebuked. DUCK DUCK GOOSE is an animated TV movie. While recklessly racing his girlfriend, a goose named Ping separates two ducklings, Chow and Chi, from their flock of ducks headed to Pleasant Valley. Bing, the flock leader and his girlfriend’s father, urges Ping to be the lead goose for the Junior geese on their migration toward the Haven. Ping refuses. Meanwhile, Chow and Chi find shelter in Ping’s nest. They form an attachment to Ping that Ping hates. A metal gong falls on Ping’s wing, making him unable to fly to the Haven. Now, he has to walk there with the two ducklings. 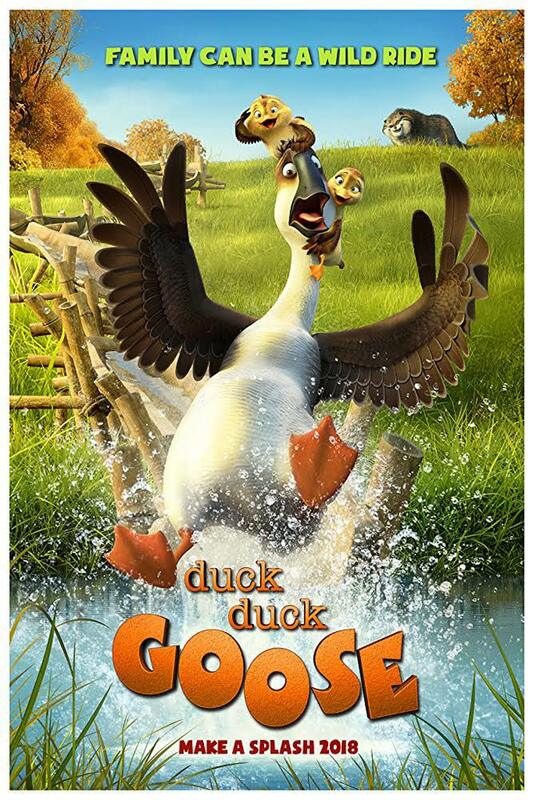 DUCK DUCK GOOSE is a delightful animated comedy. It has a strong moral worldview with redemptive elements stressing community and sacrifice. Ping goes from being a total loner to a caring parental figure and flock member. The movie showcases the value of sibling relationships. One brief scene depicts a stereotyped character who’s portrayed as a naturalistic healer. DUCK DUCK GOOSE also warrants parental guidance for cartoon violence, scatological humor and allusions to animals being killed and cooked in a kitchen.